The Lebanese Republic stretches along 250 km of the picturesque Eastern Mediterranean coast. It is only 50 km wide, a lilliput of a country which, on its total of 10452 sq. km (4035.54 sq. mi. ), is nevertheless endowed with all but the desert of nature's features. About 120 km from Beirut. Known to the Lebanese as the Cedars of the Lord. Some of the remaining 400 trees are over 1500 years old. 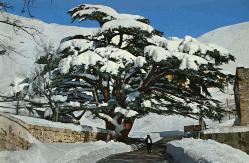 The Cedar tree, majestic and indestructible, is the emblem of Lebanon and adorns its flag. The Phoenicians, Greeks and Egyptians used its wood through the centuries in their homes, temples, sarcophagus and galleys. The village of the Cedars, over 2000 m in altitude, is a very picturesque ski resort with hotets, chalets, and ski lifts. Nearby is Qadisha grotto, a natural cavern with stalactitic and stalagmitic formations. The narrow strip of coastal plain, rich with golden beaches, natural inlets and rocky promontories, accommodates the capital Beirut and the cities of Tripoli, Byblos, Sidon and Tyre. Other large and small towns and villages dot the rest of the coast from North to South in the shadow of Mount Lebanon, which seems to rise from the Mediterranean in a sharp sweep. The main peaks of this mountain mass are al-Qorna as-Sawdaa (3088 m) and al-Mounaitra (2911 m) in the north; Sannin (2628 m) and al-Knaissa (2032 m) above Beirut, which is situated almost halfway between the northern and southern borders.